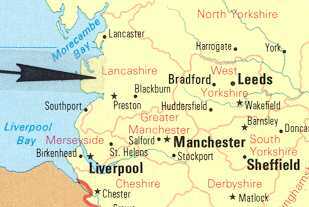 Where Is Lancashire Located in England? The County of Lancashire, where the Grimshaw family originated, is in the northwest part of England, on the west coast between Scotland and Wales. A map1 of England showing Lancashire is included at the bottom of this webpage. The closest large cities are Manchester, to the southeast, and Liverpool, to the south. Preston is the County town where the offices of the County Council, as well as the center of administration, are located. The major towns are Blackburn, Lancaster and Blackpool. 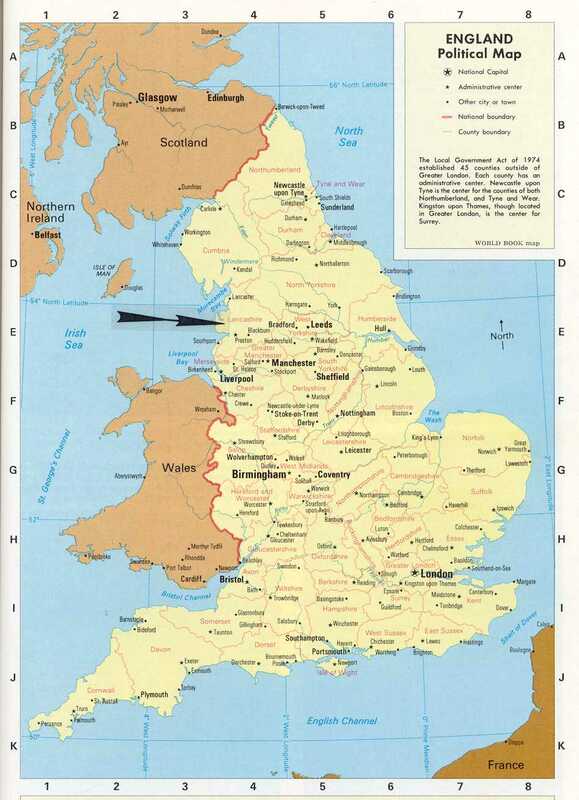 An inset map showing these cities is shown below the map1 of England. The Grimshaw family originated around Blackburn. A regional map on a companion webpage shows more detail and locations around Preston and Blackburn. And a detailed map of the area southeast of Blackburn shows the most important Grimshaw locations in Eccleshill Township and at Clayton-le-Moors. World Book, Inc., 1985, England Political Map, in “England”: Chicago IL, The World Book Encyclopedia, v. 6 (“E”), p. 241. The county is on the northwest coast of England (indicated by arrow) between Scotland and Wales. An inset map from the above map is shown below with more detail on the County of Lancashire. The major cities of Lancaster, Preston and Blackburn are clearly shown. A regional map on a companion webpage shows more detail and locations around Preston and Blackburn. Webpage posted July 2000, Updated October 2000. Banner replaced April 2011.